The Tourism Alliance has launched its Manifesto outlining a number of detailed asks so that the tourism industry can continue to deliver high levels of growth and employment for the UK. 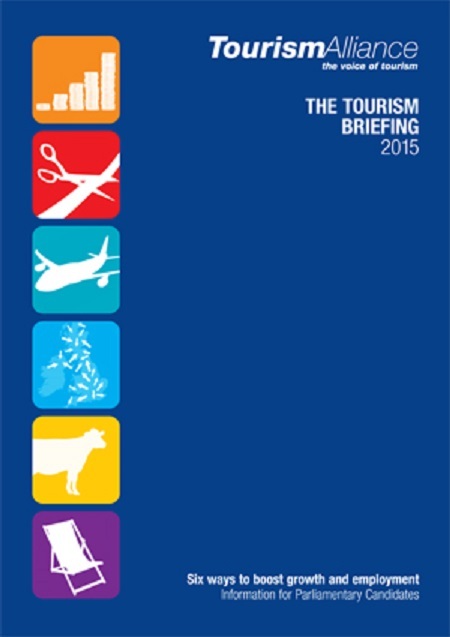 The Manifesto, The Tourism Briefing 2015, argues that even though tourism has been at the forefront of the UK’s economic recovery and is the fifth most competitive in the world, there are a number of obstacles that need to be addressed for the Tourism Industry to continue to provide its wider benefits to the UK. The manifesto identifies six areas where the Government can work with the tourism industry to deliver further growth and employment for the UK. These include Increasing Government Revenue, Enhancing Business Competitiveness, Boosting Export Earning, Driving Regional Growth, Improving the Rural Economy, and Reviving Seaside Towns. The Tourism Industry is currently the UK’s third largest employer, providing jobs for 3.1m people (over 9.6% of the UK workforce) and contributing £127bn to the UK economy (9% of GDP). To coincide with the publication of the Manifesto, the Tourism Alliance has also published its Tourism Statistics 2015 which outlines key facts about the sector. In particular, the Alliance is calling on government to continue maximising tourist-related allocations such as Defra’s new LEADER programme, and to continue supporting the GREAT Campaign.